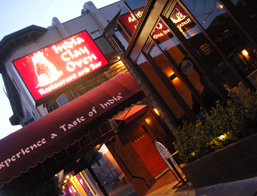 India Clay Oven is possibly the most elegant restaurant on Clement. It seems to be the highest class looking as well, and has excellent food and service. India Clay Oven features a sports bar, a banquet area, a casual dining area, and a afternoon buffet. Most of their food is baked or roasted in the authentic clay oven and is casually priced for most diners. During the afternoon, there is a buffet for nine dollars, which has all of their main dishes in the choices, including a dessert. The dining area has a brilliant view over Clement Street and is even more elegant at night. The parking for this restaurant is excellent so there’s no hassle in driving, and if there aren't any street spots, they also have a parking lot within walking distance. If you're looking for a place to take a date or a place to have a nice meal, this restaurant is the place for you. It's affordable, and conveniently located. A few things you should know about this place when you decide to eat here: Make sure you tell the employees exactly what you ordered because they often mix things up. If expecting delivery, check your order and if you want any extra sauces or such, be sure to ask for it. The buffet ends at 2:00 PM so be sure to get there a good amount of time ahead so you have enough time to eat at your own pace.